The CPU is the working part of the computer. It runs your programs, makes changes to the contents of memory, and sends data to peripheral devices. Thus, it causes the computer to produce the results you want. 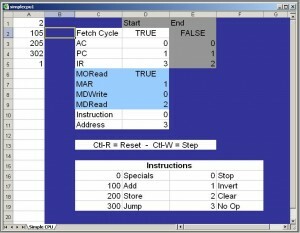 The Simple CPU demonstrates how a computer works: what some very simple computer instructions look like and how they are combined to perform a calculation.